I got a bit of free time after my exams and it is good to go home from time to time. Unfortunately I had only one weekend for this short visit, but even in a short time a lot could be done - especially when it's Ester. This time I do not want to write separate articles about trip there and back, as I already described flying to Brno and travelling with the Eurolines, so I will only focus on what was new. I should start with how I planned the trip. Flying is the cheapest and faster way how to get to Maastricht and back, but I was going back with the bus. Why? Well, the same reason why I stayed only one weekend in the Czech Republic. Change of plans – I needed to be at the university on Tuesday, April 10 at 9 o'clock as I had some duties scheduled. Before I knew this, I had a plane ticket booked from Brno to Eindhoven on Friday March 13. This would mean one whole week for meeting friends and arranging some administrative stuff. As university changed my time schedule, I needed to adapt and therefore the bus back. I wanted to seize Monday at least, as it was Ester, so I rejected taking plane in the morning and in the afternoon, as getting to the airport also take some time. Bus goes at 17 and at 23 o’clock. The second one would allow me to enjoy the Monday, but it arrives to Eindhoven at 12 o'clock which would be too late. Actually, looking at the whole picture, there are a lot of possibilities, how to get from the Netherlands to the Czech Republic. Nice Now you know what I had to go through while planning my stay home. Let's start with the courchsurfing experience. 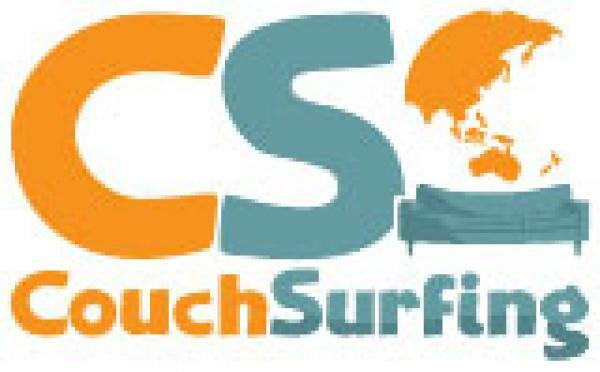 Couch surfing is a great idea for low cost travelling with the best feature ever – you get to know people living at the place you want to visit, which is better than any internet ot book tour guide (in case you want to see something, not if you want to know the facts). 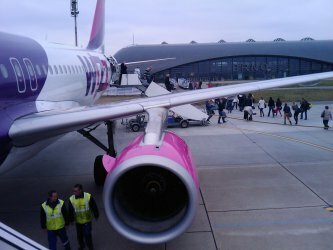 I already wrote about complications connected to the flight from Eindhoven to Prague – plane leaves at 8 a.m. and getting there in the morning is a bit risky (or not, but I'll come to that later). I decided to try to find someone, who should provide me with a space to stray for a night in Eindhoven. Couch surfing seemed like a good tool for that and I got lucky. After first negative replies, I got one positive. I The guy mentioned, that he has limited time windows, but it was ok with me as it was exactly what I needed to cover. Pepa, a 22 year old guy from the Czech Republic studies design in Eindhoven and lives in a tiny room in a house with other students. I got a mattress and a blanket and pillow – awesome. He was nice to talk to and I enjoyed the time we spend together. Next day – on Friday, he had to get up to go to work and I needed to catch an early but to the airport. 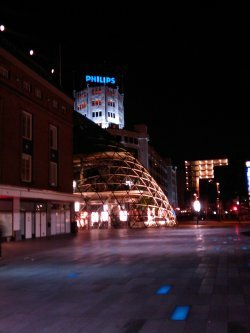 It was half past five in the morning; I walked for 15 minutes through Eindhoven to the train station and met only 1 pedestrian and 2 cyclist. I know it was Friday, but still, when do people start working in here? 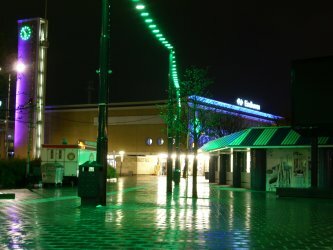 When I arrived the day before, city was already almost empty at half past 10 p.m. as everything except a few bars was closed. I missed the first bus to the airport at 5:43 so I needed to wait for another one leaving at 6:24. There was almost nothing to do at the train station and I could sit down only outside where it was too cold. At least there were night pictures of the city, so I had something to waste my time with. I needed 19 minutes to get to the train station. I observed the city from the windows and it was still dark and empty. This changed at the airport. There were a lot of people as the first plane – from another low cost airline Transavia – leaves Eindhoven airport at 7 a.m. I went through the security check and waited till I could board the plane. Then came a surprise – the last person who entered the plane is a friend of mine, who also lives in Maastricht Plane was full, but when I saw him, I kept the place next to me free for him. As I got to know, it's possible to catch the plane with the first and even with the second train going from Maastricht to Eindhoven in the morning. Good to know, next time I can avoid searching for place to stay, but on the other hand, this time couch surfing experience was really positive. As we talked the whole time and then suddenly we smoothly landed in Brno. Weather was similar – cold and clouded. I got picked up by my parents and we could go home. On Ester Monday special tradition is kept in the Czech Republic. Boys create a willow stick, hit girls with it on the bottom and sing carols This should keep the girls pretty and healthy for the next year. Boys get coloured eggs and some sweets in return. Well, as you get older, you get no longer that many sweets, but usually a shot of some liquor and the target of the carol singers is changing from getting as much sweets as possible to visit friend and have a chat. There are some modifications of the tradition in different part of our country as it's more important for some regions than to the others. Anyway, I didn't have much time, I needed to catch train at 1 p.m. in order not to miss my bus to Eindhoven with scheduled departure at 5 p.m. from Prague. Tough but manageable schedule. I got lucky and everything was on time. As said, before, I again used services provided by Eurolines. 60€ for a bus ticket was ok, but still its more than I paid for return plane ticket with Wizzair When I got to the bus station at 5:15 the bus was already there and I could get in and choose any seat I wanted, as there were only a few people inside. Later on, but got full (51 people) and we left Florenc bus station in Prague on time. The guy sitting next to me, was originally from Brazil, now learning German in Germany for 10 months so he will be able to study there. He used long weekend to visit Prague. Nice idea except the experience was not that impressive due to the cold weather. He got off at the first stop in Nürenberg along with some other people. Fewer passengers got in than out and I got double seat for myself until the next stop in Frankfurt am Main. But before we got there, we gained about 35 minutes delay due to some Police check. They took the bus out of the highway, stopped it and then checked the luggage area and talked to drivers. I have no idea what they really wanted, but we were just sitting from 23:10 to 23:45 in a bus and waited. Luckily for me, I was not that much in a rush. Bus reached its full capacity 55 passengers and I had no longer double seat for sleeping. I am not sure, how drivers made it, but despite of unplanned stop by police, we arrived to Eindhoven at 5:02 instead of scheduled 5:15. First train from Eindhoven to Maastricht goes at 6:32, which meant that I had to wait for 1,5 hours. I bought the ticket, ate something from my snack and took a picture of the train station. It was raining so I returned back to the station and sat in the waiting-room on the platform. And I met Monika – a girl from Slovakia who is for an exchange in Venlo and just returned with friends from Paris. Article last edited 10. 4. 2012, viewed: 1280-times.